Gibson Hummingbird is one of the best Gibson acoustic guitars out there. Not only that, it’s also one of the best models in the world of acoustic guitars. Their square shoulders and elaborate pickguards make it instantly distinguishable on any stage. The original 1960 model is one historic guitar for becoming the first square shoulder dreadnought that was designed to compete with the Square Shouldered Martin Dreadnoughts. 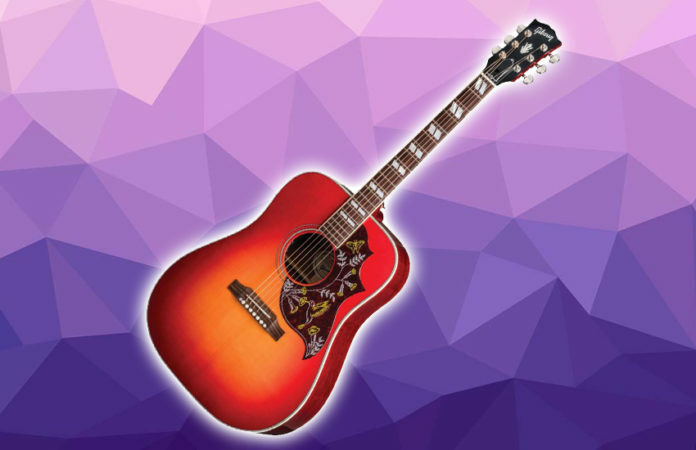 At the time of its release, the Hummingbird was the second most expensive guitar in Gibson’s acoustic lineups. It became one of the most popular as well thanks to Jimmy Page. A few Hummingbird models have been released ever since. 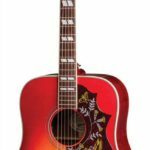 Fast forward to 2016, the Gibson Montana Hummingbird vintage edition was released as a modern take on the original and is the closest model to mimic the allure of the first Hummingbird. However, the Gibson Montana Hummingbird does not come cheap. The Gibson Montana Hummingbird is made of a solid Sitka spruce top and solid mahogany back and sides. The top and back have multi-ply binding, while inside the body is a traditional hand-scalloped X-bracing. In terms of design, this guitar looks good in a cherry sunburst, an engraved pickguard, and a nitrocellulose finish. The neck is made of mahogany and has a rounded profile. It houses a rosewood fretboard with a standard set of 20 frets and a set of mother of pearl parallelogram inlays. On top of those is a robust Tusq nut. In terms of hardware, the Gibson Montana Hummingbird does not disappoint. On the headstock are a set of Grove Rotomatic tuners with kidney buttons and nickel tuning plate. The guitar also features a Tusq saddle and a rosewood bridge with Tusq bridge pins. You can tell by the hardware and tonewood alone that the Gibson Montana Hummingbird is not like most square shoulder dreadnoughts in the market. But it does not stop there. The Stika soundboard is torrefied to resemble the structural and sonic properties of the old wood. For the uninitiated, that is something a pro player would “die” for. The sound is where the game ends and make your decision a no-brainer. The Gibson Montana Hummingbird has a perfectly balanced sound — the bass and treble frequencies are so even while all the registers have outstanding clarity. This guitar is also free from fret buzzing just like any vintage Hummingbird. No matter what region of the fingerboard or what harmonic choice, you can distinguish each note of chords without trying too hard. It makes both compact and full chords sound lively without being boomy or overly loud. The Verdict: Should You Buy Gibson Montana Hummingbird? The craftsmanship on the Gibson Montana Hummingbird is impeccable. There is not a flaw in the nitrocellulose lacquer finish on the neck and body. The binding and inlay work are clean and attractive. This guitar is the epitome of an instrument that sounds and plays as good as it looks. 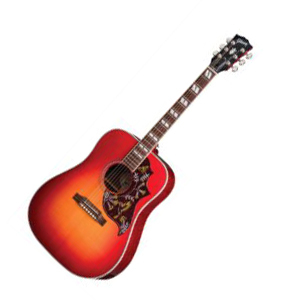 Much of the Gibson Montana Hummingbird’s charm lies in its versatility. No matter how you attack this guitar, it delivers rich, deep tones. If you have the extra cash to spare, this guitar is no doubt a worth it investment.